It was Friday morning, August 5th. I was about to begin the day at my desk when I thought I would check my email one more time. And there it was; "Red Alert" - the Xtreme Dream was on. 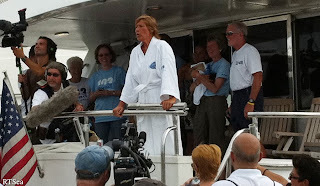 This was the moment that ocean marathon swimmer Diana Nyad had been waiting for, when the word would go out to her team of boat captains, kayakers, trainers, media consultants, supporters and friends to come to Key West, Florida as quickly as possible. From there, all would travel in a flotilla of boats to Havana, Cuba, to be with Diana as she set out to reach a goal that had been on her mind since the late 70s: to swim in open water from Havana to Key West, 103 miles, in approximately 60 hours non-stop, now at age 61. I had the rare privilege to work with Diana in late April, filming her from an underwater perspective at Pepperdine's Olympic pool in Malibu, CA, for CNN. It was there that I first learned of her goal of making the swim from Cuba to Florida and I saw firsthand the energy and passion that she had in taking on this goal, not only as a competitive athlete but as someone who felt unencumbered by the personal myths and preconceived notions of age. Although of similar age (she is 61 to my 59 years of age), I must admit, I did not know of her prior accomplishments 30 years ago as a world record holder in endurance swimming. A little time spent on the Internet and I quickly realized that I had been fortunate to spend a brief day not with a geriatric hell-raiser bent on some sort of stunt, but with an accomplished and committed professional and a veritable force of nature. And that was that; or so I thought. Because of both my professional film/video background and kindred relationships with several leading members of the shark conservation community, I was called upon in late June to join her team of safety divers and to film her underwater during her swim. Everyone on the Xtreme Dream Team would be essentially "on call" waiting for the optimum conditions that Diana required to make the attempt. The prime ingredients: warm water temperatures in the high 80's and flat, doldrums-like ocean conditions. This is something that mother nature does not give up easily. July is probably the best month of the year to achieve both such conditions for any reasonable length of time, but this year July had not followed the norm. And so the days and weeks dragged on with email updates flying out to the team covering the latest weather reports or how Diana was feeling, and what she was doing to stay at the physical peak she would need. Laced through all of these communiques was the enthusiasm and encouragement of team members and Diana herself. 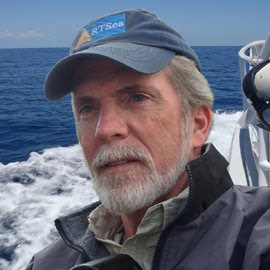 The safety diver team was headed up by my friend Luke Tipple - marine biologist, dive safety officer on many television productions, and Director of the Shark-Free Marina Initiative. Several other leading pro-shark professionals were enlisted to round out a team of four but due to scheduling conflicts as the weeks wore on, some would have to regrettably drop out and others were called upon to fill in. From the first meeting held to discuss safety diver protocol right up to the moment of the event, one mutual understanding between the divers and Diana existed: in the course of ensuring her safety in the presence of any sharks, only non-lethal techniques would be employed. No harm would come to any shark in the course of our duties. 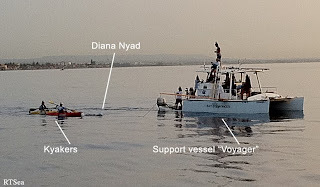 So resolute were the divers in this regard, that when the New York Times reported on Diana's upcoming swim and erroneously described her safety team as "divers with spears," there was a momentary blow-up and some of the team members chose not to be involved with an endeavor that would have them characterized in such an anti-conservation manner. In the end, while many - including the divers - wanted to downplay the "shark-infested waters" angle and focus more on Diana and the swim itself, eventually Diana laid out her position regarding sharks so that members of the ocean and shark conservation community could be put at ease - despite the media's ongoing fascination with a sensationalistic shark angle. Her is a portion of what she wrote for CNN's Health blog, The Chart, "Our team has worked hard toward this world record. But it is of paramount importance to us that we achieve the dream in perfect harmony with all the creatures of the sea we encounter . In some regard, I am humbly asking the sharks of this particular ocean to allow me to skim across the surface of their home for about three days. I am duly respectful of them, their habits and their habitat, as is every individual on the Xtreme Dream Team. We are humbly entering their world, their territory. Yes, let’s not be naïve. There is reason to take intelligent precautions for my safety. But it is imperative to me and every member of my team that those precautions be in the hands of a highly expert, experienced team of four divers who are versed for many years now in using cutting edge, nonlethal technology to deter sharks. These divers dedicate their lives to raising awareness for sharks and persuading nations around the world to ban shark finning." Of course, in times past, this proactive non-lethal approach would not necessarily have been the case. And I can understand any trepidation that Diana might have had regarding sharks. Consider her environment - constantly swimming, rotating her head to take a breath and check her position in relationship to nearby kayakers and support vessels. She just wouldn't have the luxury that scuba divers or snorklers have of looking around at what might be swimming underneath and that can certainly prey on the imagination. 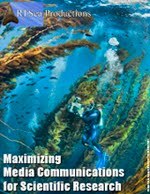 Add to that, the media frenzy that surrounded swimmer Penny Palfrey, following her Cayman Island swim where she encountered several sharks that were mistakenly reported by the press as having been killed, and it became very clear to Diana that a pro-shark protocol sufficient to protect her and the sharks was needed. We had a range of steps and options with regard to any shark encounter, but rather than detail them here, you can read about them at Luke Tipple's website. Ultimately, Diana's safety diver team consisted of Luke, myself, Capt. Rob MacDonald, and Capt. Jon Rose. We were ready to go; the August tropical storm/hurricane season was bearing down and the windows of opportunity were narrowing. When tropical storm Emily, which was initially bound for Cuba and then the eastern Florida coast, dissipated unexpectedly, a potential weather window had opened. The word went out: the time is now. 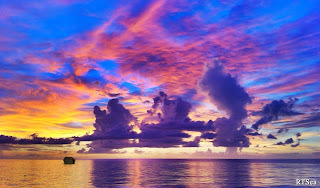 Quickly taking care of my personal affairs, I grabbed my dive and camera gear that had been packed and patiently waiting, and took the next available flight to get me to Key West where the first step - going to Havana - was being staged. Diana's logistical team had the imposing task of coordinating the arrival of several dozen team members and observers from all across the country and getting them to their assigned vessels for the ride out to Havana - a difficult enough task if they had had a fixed date weeks in advance, but the nature of this event precluded such an advantage. Diana had moved on ahead to Havana and now the rest of the team must quickly catch up. The safety diver team was assigned to the Mirage, a unique type of custom outrigger/catamaran designed for accommodating kayakers on ocean expeditions throughout Florida and the Caribbean. With kayaks and dive gear all aboard and all passengers accounted for (except for our fearless leader, Luke, who was hung up with flight delays), we set off at seven that evening for Cuba. Luke would follow up on another boat leaving early the next morning. The passage across the Florida Straits was mostly smooth and uneventful with only one period of rougher seas and windy weather - not the kind of thing an endurance swimmer wants to contend with, so we all hoped for this to be momentary departure from the anticipated ocean conditions Diana was counting on. 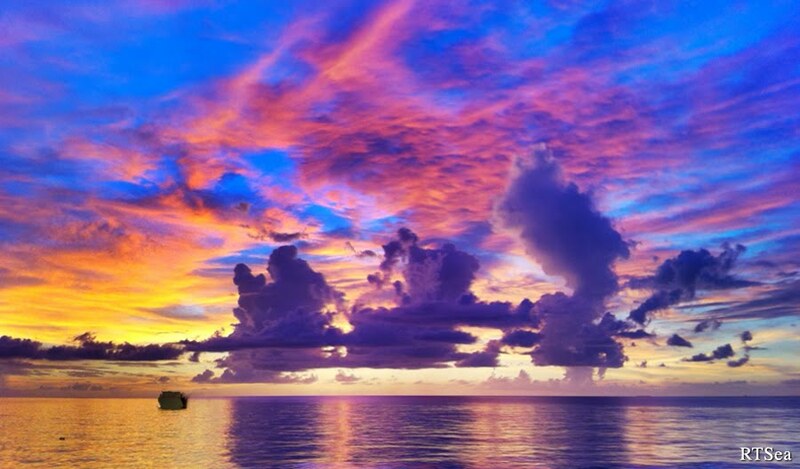 Sunset was quite literally an explosion of color and many of us reached for our cameras to hopefully capture its beauty before the sun disappeared below the horizon. The crossing would have been idyllic but for the oppressive and stifling heat and humidity that is common for this time of year. Many of us chose to sleep out on the open deck. During the night I awoke to see a veritable ocean of stars, a sky alive with constellations and shooting stars, the likes of which I hadn't seen since gazing at the sky years ago in California's high desert. As we approached Havana around midday, we assembled all the necessary passports and state department letters which Diana and her Havana ground ops team had worked so hard to have for us in time for the crossing. (Diana had missed an opportunity last year at making the swim because of delays in obtaining all of the required paperwork before the optimum weather window closed for the season.) Reaching Cuba were the key vessels, Voyager, Bellissimo, and the Mirage. Other support vessels would meet us out in international waters, just outside the 12-mile limit. We arrived west of Havana at the Hemingway Marina - a nod to the days when Ernest Hemingway would spend time in Cuba, writing, drinking, and fishing - but rather than partake in any of those activities, we settled in for several hours of customs and immigration inspections. When finally allowed to put our feet on Cuban soil, we quickly had to re-group at the local marina yacht club for a meeting. Diana was there to welcome us all and give us a quick rundown as to what would be happening next. It was a strange mix of excitement and confusion. There would be no settling back in old leather chairs, knocking down a few beers or tasting the local cuisine. 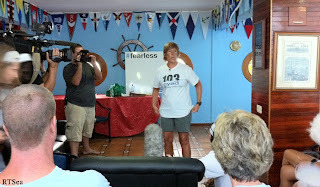 The narrow weather window, combined with the time spent being cleared by Cuban officials, only allowed for a quick update from David Marchant, Diana's navigator, as to upcoming ocean conditions followed by one final expression of determination from Diana along with her gratitude to all of those on the team. Just the day before, there was a press conference held, attended by reporters from across the globe. The buzz was in high gear and the Xtreme Dream was real, it was international, and it was fast upon us. After going through another round of customs so that we could depart, our brief stay in Cuba was over and we positioned ourselves just outside the marina along a seawall where Diana would start. There was a crowd of both American and Cuban supporters awaiting Diana's arrival. It was a curious sight, given the strained relationship that has existed between Cuba and the United States for so many decades. A large Cuban flag was erected at the starting point and many in the crowd shouted, "USA, USA, USA..." For a moment you could sense the walls erected by politicians and ideologies had come down, all around this one event and the determination of one woman. Finally, at a little before eight o'clock, the moment had come. Jumping into the water, Diana swam out to position herself next to the lead support vessel, Voyager, a small catamaran that she had been working with for some time as she trained for this day. Extended from the starboard or right side of Voyager was a boom holding a long strip of red LED lights and a wide white ribbon of vinyl plastic. Together, day or night, these two would act as, essentially, a visible stripe down an oceanic highway. Diana would follow the stripe and the Voyager would then be better able to keep her on course. Trailing next to her were two kayaks to also help keep her on course. Each kayak carried an electronic device called a Shark Shield. The Shark Shield gives off a very low electrical field that has been shown to be very effective in repelling curious sharks. With each kayaker carrying a shark shield suspended below their kayak, Diana would be swimming inside an electrical bubble, so to speak. Encountering a more determined animal, we safety divers would have to then enter the water and chase it away using poles with padded tips. However, sharks were not foremost on the minds of the handlers and crew on Voyager at the start of the race. What was important was for Diana to find her stride, set a comfortable pace, and concentrate on moving forward. Florida awaits. As the sun began to set, the first challenge to Diana's goal reared it's head. Only three hours into the swim, her right shoulder began to bother her and with each and every stroke the pain became more excruciating. But still, she kept up her pace, stopping every 45 minutes for fluids or a high protein liquid meal. When I heard from one of the team that Diana was experiencing some shoulder pain, I immediately recalled her mentioning to me in April, at Pepperdine, she had a previous shoulder injury that she always had to be conscious of not exacerbating. But that was her left shoulder. Her right shoulder compensated and was particularly strong throughout all of her training, so this new development came as quite a surprise to all. To be in accordance with all the recognized rules and regulations for marathon swimming, crew members have to be extremely careful in how they come in contact with the swimmer. Any extended contact can be perceived as assisting the swimmer through the water, thereby disqualifying the swimmer from any official record. And there were observers on board watching throughout the swim. So, Diana's handlers carefully provided her with Tylenol and an ice pack to use during her fluid/meal breaks to hopefully ease the pain in her shoulder. In the meantime, with Luke set to arrive the next morning, the safety diver team had to make some adjustments to their original planned schedule of two divers on, two divers off in four-hour shifts. We decided to position Jon aboard the Voyager while Rob and I would follow along in a large, solid keel, powered inflatable - a common fixture found on large boats and luxury yachts. Performing a shark watch at night is the most challenging as your use of any type of searchlight is very restricted. Bright beams of light moving through the water can be very distracting, if not outright alarming to the swimmer. But with the three of us now in position, we settled in for a long night. We would be going non-stop until Luke arrived the next morning. Of course, there was no whining; all you had to do was listen to the rhythmic splash of each of Diana's strokes to remind you who was really doing the hard work - hundreds of strokes each and every hour - focused and in her zone, trying to ignore the searing pain that was racing through her shoulder. Ocean conditions were changing and not necessarily for the better. There were periods of relative calm, but any stretch of swells or wind-induced chop would work against her, knocking her about and making staying on course all the more difficult. The currents that move through the straits between Florida and Cuba can change direction from predominantly west to east or vice versa, or even double-back and become a mixture of the two. At the start of the swim, currents were basically moving in a northeasterly direction, so either Diana would need to push into the current to stay on her course line or make a series of course corrections, possibly ending up further north of her intended final destination and adding a few more miles to the swim. As night slowly turned to morning, another challenge raised its head. Diana began to feel her breathing becoming restricted, more labored. She was having an asthma attack! This had never happened to her during all her years of swimming. The difficulty of having to deal with it now only added to the frustration as to why. Why? Was it induced by stress? Or perhaps a reaction the pain medication? Diana only takes Tylenol as she has bad reactions to aspirin or ibuprofen, but she was assured by her physician on-the-scene, Dr. Michael Broder, that she had only been given Tylenol. That morning, Luke arrived on one of the smaller support vessels and joined the rest of the team. I was now atop the Voyager, watching the waters for any uninvited guests. Schools of baitfish would occasionally boil at the surface or yellowtail would come by to inspect the trailing ribbon that ran underneath Diana, like the arrow on a compass. But for now, there was nothing to worry about as far as sharks were concerned. The safety divers had their job to do and so did Diana's handlers, lead by her business partner and close confidant, Bonnie Stoll. Bonnie is another strong personality. A bit brusk at times, or in-your-face if need be, she is also Diana's number one supporter and cheerleader. Bonnie is absolutely relentless in her ability to keep Diana focused, to keep her emotionally pumped up. Some of us have that little voice that speaks to us inside our heads, that gets us out of bed and moving. Bonnie is that voice, literally and forcefully, for Diana when she is swimming. And right now, with all that had happened to Diana in the first few hours of the swim, Bonnie was needed more than ever. Rarely have I ever seen a relationship between any two people that is as supportive as what I saw between these two: the swimmer and the clarion supporter. But it was becoming more and more of an uphill struggle for Diana. The asthma was depriving her muscles of critically needed oxygen, sapping their strength. Dr. Broder had Diana try an inhaler and gave her antihistamines but their effectiveness was being countered by the sheer physical effort that Diana was expending. She couldn't take a break, rest a while on the boat while the medications kicked in - that would end the swim right then and there. So, Diana would soldier on, hearing words of encouragement and support from her handlers, the kayakers, the crew, and of course from Bonnie. Even in an ideal set of conditions, marathon swimming extracts a heavy toll on the human body. Sleep deprivation, leading to hallucinations; vomiting from the cumulative ingestion of seawater while swimming or drinking; hypothermia; the assault on your entire internal system from the loss of electrolytes, despite continued efforts to replace such fluids. Over so many hours, the human body slowly begins to shut down. Only a determination in mental focus can get a well-trained athlete through it. Diana is just such an individual; but now she is being put to the test. What might have been surmountable over the course of several days has befallen her within the first twenty-four. In a peculiar way, it was both inspiring and painful to watch. Diana would take a break, floating on her back, bemoaning why these things were happening to her all at once. Drinking fluids and trying to keep food down, Diana would often look at Bonnie or her handlers with a distant, faraway look. Bonnie would be giving her words of encouragement while David Marchant and the other crew members would be discussing her current course and what progress was being made. Perched atop Voyager, I wondered how much more of this Diana could take. And just when I thought she might be contemplating calling it quits, she would roll over and begin swimming again, that rhythmic splash, splash, splash of each stroke ringing across the water. There were times when I just couldn't believe what I was seeing. During one of my breaks, I prepared my underwater video camera to film Diana from underneath. I needed to have Diana's handlers let her know I would be coming into view from below, so as not to startle her. With camera ready, I rolled over the side of the inflatable with the idea of filming Diana as she ended a fluid break and resumed swimming. I saw her roll over and begin to move forward, so I pushed the record button. Just a mere few seconds into it and suddenly an error message appeared in my viewfinder! A digital media card was malfunctioning and in the classic manner: at the worst possible moment. I returned back to the Mirage to sort it all out, revising the game plan by hoping to film her again tomorrow, Tuesday, as by now the light was beginning to fade. My next scheduled shift was from eight to midnight that evening. When I was shuttled back out to the Voyager, I could see that Diana's condition had worsened. Her pace was much slower and her breaks were more frequent and lasting longer. Additionally, the current was definitely working against her now. She would swim for a few minutes, still following Voyager's illuminated stripe and bordered on each side by the kayakers. But then she would stop, roll over, and you could see the current drifting her back. After a few minutes, she would roll back over and resume swimming but she was definitely losing ground. Calculations were being worked out and estimates were being discussed. Twenty-four hours into the swim, perhaps a third of the way across, but with her slower pace she could be looking at 60, maybe even 80 more hours. The human body could not withstand such prolonged abuse. As the evening wore on, Bonnie was there to spur Diana onward. She kicked it into high gear, giving Diana a series of a-atta-girls to snap her out of the hallucinations Diana said she was beginning to have. ''You can do it. You can make it. There you go. That's it," Bonnie called out across the water. When Diana would stop and roll over, Bonnie would go into overdrive to get Diana's attention, asking her questions, keeping her communicating. Then at one point, Bonnie lowered her voice and talked to Diana as she treaded water alongside the boat. Bonnie talked of options: stopping right now or continuing onward. "Whatever you want to do, I will support you." Tears welled up in her eyes and that strong voice I had been hearing throughout the day was now aching, openly feeling Diana's pain. Diana could only gaze at her, nearly unable to speak. It was one of the most heart-wrenching moments I have ever witnessed: the devotion of two people to each other and to a long struggle for a sought-after goal - all being put to the test somewhere in the middle of the ocean between Cuba and Florida. Somehow, from somewhere deep inside, that determination which has pushed Diana as a world-class athlete, which propels her to believe what she has accomplished in her younger years is only a prelude to what she can do throughout her entire life at any age, that spark was still alive. Diana rolled over and resumed swimming. Jon Rose and I finished our shift at midnight, with Luke and Rob coming to relieve us. Diana's pace seemed to be improving. She was mixing in a breast stroke - new to her - along with her usual freestyle. Jon and I motored back to the Mirage and I was thinking that what I saw at eight o'clock was the beginning of the end but what I saw by midnight gave me some encouragement. But it was not to last. I was told that Diana was questioning whether she could go on, that the shoulder pain and asthma would never allow her to finish. Bonnie told Diana it was her decision, that if she took her hand it would all be over. Diana knew it was her decision and hers alone. Surrounded by friends and supporters all inspired and moved by what she had endured over the past thirty hours, Diana took Bonnie's hand and called it a night. Luke jumped into the water to assist in getting Diana out and Dr. Broder began treating her dehydration, vomiting, and hypothermia. The Voyager headed to the Bellissimo where Diana was brought on board for further treatment. And with that the Xtreme Dream came to a close. All of the vessels set a course for Key West to offload gear and get through U.S. Customs and Immigration. Back at Key West, the news media awaited for Diana to step out from the Bellissimo. With cameras rolling and team members, friends and supporters cheering, Diana emerged to say a few words. It was hard. She broke down several times and you could feel her disappointment. Now she would be faced with the countless interviews where she would have to relive it again and again, something that many athletes have to contend with; finding how to put the loss of a specific goal in context with their overall record of achievement. How does an Olympic athlete deal with years of training and preparation, only to see it gone in a instant? Or a professional football team with a perfect season losing the Super Bowl? How do you reconcile your capabilities with what fate allows to transpire at any particular moment? Dealing with those feelings can be the true signs of a hero and Diana is already showing she has what it takes to put this all into perspective. Before the team left the Key West marina, Diana came out to thank each of us and we thanked her right back for all her enthusiasm and inspiration. I had a brief moment where I said to her, "You may not have reached the 103 miles, but you gained 103 million supporters instead." From that first day in April when I met Diana Nyad, I have been inspired by her passion in believing you can reach for anything you wish, regardless of any obstacle that the world might put in your way. At age 59, I am pursuing a career in a field populated with many people half my age. But with role models like Diana Nyad, what I wish to accomplish in film and conservation seems well within reach. I am honored to have had the opportunity to meet Diana. Sometimes life reminds us that a specific goal may be far less important than the actual journey and the people you touched or who touched you along the way. Are you listening, Diana? There you go. That's it. Read more blog entries posted during the swim at Diana Nyad's website. Read and watch a series of live news updates from the swim by CNN. Read Luke Tipple's account of the end of Diana's swim. Wow! What a story! And told beautifully, Richard. Diana IS indeed and inspiration. Congratulations to Diana and to you, Richard, for being part of the team and telling the story so well. The article was beautifully written and revealed the hard fought challenges that Diana faced with such courage, she is an amazing athlete. Cheers to Diana and her incredible dream team! Thanks for a wonderful report on the swim, Richard. Those of us who were on the friend's boat cherish these reports as a record of the drama that unfolded over those two days. I was also very disappointed that Diana was hit with some serious health issues. There is so much training involved for it not to truly hurt to the core, but...it is a great story. I do hope she thinks about doing it again...it'd be something we'd definitely cheer for.